New Zealand has more flightless bird species than any other country - eight of them rails. Five of the eight extinct rail species of the Rallidae family which were all endemic to New Zealand were flightless. Three of the five living rail species are flightless and endemic. Takahe are one of New Zealand's storm-blown land bird migrants from the Australian continent. Since its possible Miocene-Pliocene arrival 5 to 20 million years ago, it has diverged considerably from its origins, becoming totally flightless. 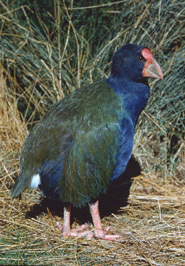 The related pukeko that arrived with a more recent migration during the Holocene, has changed little and is not distinguishable from Australian forms. Hear the call of takahe MP3 627K 38 sec. Hear another takahe call MP3 639K 39 sec. The very colourful green, turquoise and blue South Island takahe Porphyrio hochstetteri is a member of the Rallidae family of rails, crakes and coots, of the Gruiformes order. The takahe is endemic to New Zealand, and has the distinction of being the world's largest living member of the Rallidae family. 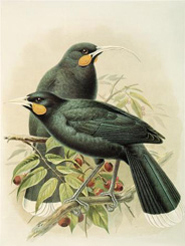 The remaining species are the remnant of the South Island population resulting from speciation. 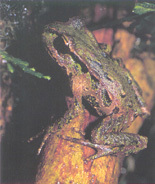 The North Island species Porphyrio mantelli which was taller and thinner boned is extinct. It is only known from skeleton remains. An adult takahe is stocky, weighing up to 3 kg (6.5 lbs), standing up to 50 cm (20 inches) tall, and reaching 63 cm in length, about the size of a chicken. Females are slightly smaller than the male. As typical of most of the flightless birds, it has short stout but strong, red legs. Every part of the takahe is solid, except its' small wings of course, that are only used for display. Its' impressive red beak is so solid it looks strong enough to cut number eight fencing wire. Takahe are similar in appearance and coloration to the smaller pukeko Porphyrio porphyrio, which is another native rail, but common worldwide. Pukeko still fly, but poorly for short distances in escape in the open. They have been seen on rare occasions roosting in small trees. Their favoured habitat is a lake edge, but they are also grazing birds, successfully adapting to pasture, and are found on low-lying farmland and near roads where drains attract them. In the Fiordland native habitat, curled, mid-ribbed, and broad-leaved snow tussock grasses provide food and shelter for takahe. Nesting pairs build a raised ground nest of snow tussock grasses in October after the snow has melted. Eighty percent of the one to three eggs laid each year hatch after 30 days of incubation, which is shared by the male and the female. Chicks are fed by both parents for three months. Only one chick will normally survive the first winter. Takahe translocated from remote alpine habitat have easily adapted, feeling quite at home in the environment of predator-free offshore islands, and unafraid of humans. Below: A South Island takahe feeding its' chick. Copyright © Geoff Moon. Takahe provide another intriguing story of life on the edge for New Zealand's endangered avifauna. They were once found every-where on both mainland islands. The first specimen recorded by Dr Gideon Mantell was caught alive on Resolution Island in 1849 by a seal hunter's dog. Another three takahe were found the same way, but this was all that was known about the bird in 1900 so it was assumed to be extinct. This in no way deterred Dr Geoffrey Orbell, an amateur naturalist from Invercargill, from an intensive search in a wet, remote region of the Murchison Mountains in Fiordland. It is a place where 250 inches of rain fall in a year and many areas are still untrodden by humans. On his first visit footprints were found, however, on a second visit in 1948, two takahe were rediscovered near the shores of Lake Orbell, causing a sensation amongst ornithologists throughout the world. In that year 400 birds were found in alpine tussock grassland of the Murchison Mountains and two adjoining ranges. The total amount of each takahe donation made to Terra Nature Fund will be used for predator control, nest monitoring, bird transfers, egg incubation and hand-raising by New Zealand Department of Conservation biologists. See more on the Takahe Recovery Programme, which is managed by the Threatened Species Trust. Contributions made to Terra Nature Fund are tax deductible in the United States ..... donations made directly to the Takahe Recovery Programme are not. Photo left: Takahe Porphyrio hochstetteri. Crown copyright © Department of Conservation. Like the moa, takahe numbers shrank from Maori hunting, as shown from bones found in middens. But unlike the moa, a few takahe survived in the harsh, wet environment of the Murchison and Stuart Mountains, safe from human killing. While isolation saved them, survival was still threatened from heavy grazing of their tussock grass habitat by introduced deer, and nest and chick predation by stoats. Takahe are now protected in the wilderness of Fiordland National Park, which is New Zealand's largest national park, and a World Heritage area. However, takahe have not made a comeback in the natural habitat in which they were found in 1948. The population dwindled from 400 to 118 birds in 1982. This was mainly caused by deer becoming well established throughout Fiordland in the 1940s and 1950s. There has been a slight recovery to 160 birds since deer have been controlled with hunting by helicopter. A better population increase may be restricted by stoat predation, which is controlled during the nesting period and when chicks are vulnerable, but has practical limitations. Department of Conservation biologists used their offshore island sanctuary experience in establishing safe habitat for takahe on Maud Island in the Marlborough Sounds, Mana and Kapiti Islands north of Wellington off the Wairarapa Coast, and Tiritiri Matangi Island in the Hauraki Gulf. The offshore population has grown to about 60 birds. 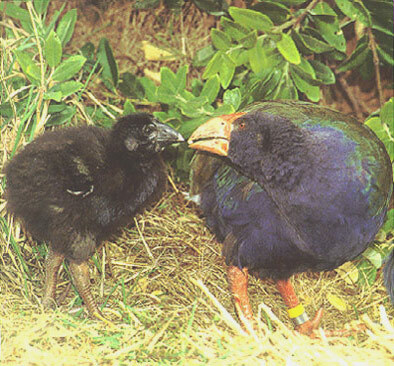 South Island takahe were reintroduced onto Tiritiri Matangi Island, a restored island off the Whangaroa Peninsula northeast of Auckland. The birds are cheeky and friendly, so be careful, they might steal your lunch. A visiting journalist, Edward Kanze wrote of his experience "... a takahe that followed my wife, Debbie, and me along the Ridge Track, 'tasting' our trouser legs whenever we slowed to look at something. Sometimes the bill found flesh. This was the first time either of us had been nipped by an endangered species ..."
Copyright © 2007-13 TerraNature Trust. All rights reserved.